The Florida girls showed up in the championship race this weekend. 3A state champion and ARP course record holder, Valerie Lastra, became the first female Miami-Dade athlete to qualify for a national meet with her fourth place, 17:17.12 performance on the McAlpine course. Lastra has improved by nearly a minute since her 2017 and keeps adding accolades to her records. 4A state champion and now two-time national qualifier, Alyssa Hendrix, finished seventh in a PR of 17:24 and will be going back to San Diego with Lastra. These ladies are only juniors and have had very strong seasons, breaking history along the way. East Lake breakout athlete, Parker Valby, has had one heck of a season -- improving by over a minute and half compared to her 2017 cross country season. Valby finished 17th in the championship race in another sub 18 minute performance of 17:51. Claire Openshaw was Florida's number four athlete with her 18:11, 24th place performance. Coming off a sub 18 minute, regional title and strong state meet performance, Openshaw closed her season with a strong performance heading into the track season. Davidson signee, Natalie Abernathy, was Florida's number five with her 18:16.23 performance with FSU signee, Rebecca Clark, right behind in 18:16.93. Liina Winborn and Erica Fisher close out Florida's top eighth with their 18:17 and 18:26 runs on the McAlpine course. Lastra, Hendrix, Valby, Openshaw, and Clark were the top five scorers for the Florida girls and brought home a second place finish for the state in the Championship race. Way to go ladies! Lydia Friedman was the top Florida finisher in the junior and senior race with her sixth place, 19:28, performance. Freidman's Foot Locker South performance was a 30 second improvement from her state finals race two weeks ago and a very strong finish to the junior's season. Stephanie Ormsby and Mo Palmer went two and three for Florida with their 19:51 and 20:00 finishes. Palmer raced the FACA All-Star meet the week prior and finished seventh in a time of 19:54 -- her 20:00 performance was a great close to the senior's cross country season. Lana Rukab (20:03.17), Carolina Titus (20:10.01), Emma Lorey (20:11.26), Sarah Schultz (20:11.89), and Kemper Reback (20:12.53) packed it up in the race to have Florida's top eighth in the top 35. After her breakout 4A state runner-up finish, Alicia Ruiz, finished fourth overall in the Freshman/Sophomore race in a time of 19:03. Freshman, Amber Schulz, was Florida's number two with her eighth place, 19:16, performance. Sarasota duo, Kasumi Wade and Marissa Kempf, went three and four for Florida with their 19:33 and 19:41 performances. 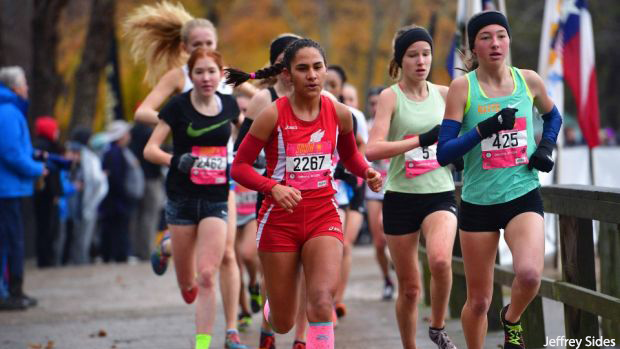 Cristal Gomez capped off the top the top five with her 19:48 performance. The freshman/sophomore Florida ladies had their top five all sub 19:50 and with their sixth and seventh athletes, Brooke Mullins and Jordan Ford, running 19:52 and 19:58. These underclassmen showed the state the depth that will arise in the 2019 season after these ladies have some strong track seasons under their belts. Sarah Raucci out Tavares was the first Florida female in the girls 13-14 YO 5k race. Raucci ran a time of 22:44 with Madden Lorraine, out of Melbourne FL, behind her in a time of 23:48. Allison Horsford was third for Florida girls in 25:12 and capped off the Florida 13-14 girls team. Noelle Vu was the first Florida female finisher to cross the line in the 11-12 YO 3k race. Vu ran a time of 11:36 to finish 30th overall in the mixed boys and girls race. Johanna Velez was ten seconds behind Vu and finished in 35th place overall with an 11:36. Maya Rodriguez was Florida's number three with her 12:02 finish, Loni Jorgensen was Florida's fourth with her 13:06, and Rachel Horsford wrapped up team Florida with her 13:32 3k race. These ladies demonstrated strength in the weather conditions they ran in and will now head into strong middle school track seasons. Layla Fuller was all smiles after her big win in the 10 and under 3k race. Fuller was the first female finisher and would also have been the first Florida girl in the 11-12 3k race with her 11:25 performance. Fuller has had one heck of a middle school season, as a fifth grader! Nadia Cohen was Florida's number two finisher with her 13:17 performance with Anderson Rubin taking Florida's number three spot in 13:42. Katelin Wilcox and Megan McCarthy finished out Florida's top five with their 14:02 and 14:15 3k races. Great racing by these young athletes, the future is very bright in the sunshine state!